It’s good to know I’m no longer a nerd. I was growing worried since I frequently (okay, almost always) watch TV, work on my computer (writing this blog, perhaps?) and check my BlackBerry all at the same time. Nielsen’s fourth quarter Three Screen Report, a regular analysis from Nielsen’s Anytime Anywhere Media Measurement initiative, reveals that the typical American continues to increase his/her media time, watching each week almost 35 hours of TV, 2 hours of timeshifted TV, 22 minutes of online video and 4 minutes of mobile video, while also spending 4 hours on the Internet. In addition, Americans now spend 35 percent more time using the Internet and TV simultaneously than they were a year ago – now spending up to 3.5 hours each month surfing the Internet and watching TV at the same time. I’m not revealing how closely I’m in line with these findings. What I do know is that I still need at least one night a week where I shut off the electronic devices and read a good book (I love turning the pages and not on a Kindle) or writing in a journal with a pen (yes, they do still exist). How wired are you? And do you take time to shut off your electronics? I have three interns working for me this semester. One of them graduates in May with a degree in multimedia – a field that didn’t even exist when I attended college. Today, if you don’t have multimedia skills or know how to manage those with such skills, it’s going to be difficult to find a job or advance. In my day-to-day work, we take photos from the field and create mini scrolling slide shows. They look like a short video. It’s easy to do using Windows Movie Maker. Creating online publications is easy, too, thanks to software, such as Publisher. We post videos that we created using a Flip Cam to our YouTube channel. My point is that so many things that once required a large capital outlay and investment in time, can be accomplished cost effectively and with only a short investment in time. So how you do you get started if you don’t know anything about this field? SPJ published “Digital Media Handbook, Part 1” online (of course!). You can download it for free as a PDF. I’ve resisted ranting on my blog. But this past week I’ve received several voice mail messages at the office in which the person speaks so quickly that I don’t get their name or phone number and then they disconnect. Sorry folks. I don’t have time to replay your message repeatedly to figure out your name and phone nu mber if you are going to speak at the speed of sound (pun intended). An easy fix is to SLOW down when you leave your message. I do want to reply — even if it’s a cold sales call. You might be calling with a product or service on the very day I determine I need it. But if I can’t make out the phone number, it’s the delete key for you. Another fix is for you to repeat your name (you could even spell it) and your phone number. That way I can fill in the missing blanks. Even better, use both options. So slow down. It’s not a race. And you aren’t going to win if I can’t understand how to do business with you. NFPW and VPW member Julie Campbell always has been a horse lover. 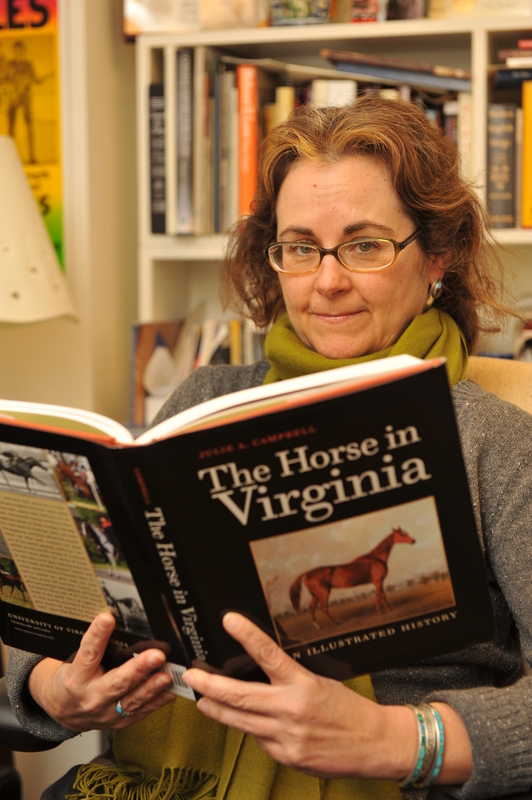 So it was natural for her to write a book about the horse in Virginia. She just didn’t realize how long it would take. She worked on the book full time while researching and writing on evenings, weekends and days off. “When you boil it down to time I spent just on the book, I’d guess it took about two years,” she said a few weeks before her book tour kicked off. But then there was another year when it went through two rounds of anonymous reviews and subsequent revisions. She also had to find the illustrations and obtain their accompanying permissions. Tack on another year or so for production: copyediting, design, proofreading, indexing and printing. The Horse in Virginia: An Illustrated History explores the history of horses in Virginia during four centuries, including how the horse fit into society at any given time. The University of Virginia Press developed the concept and hired Julie to write it and find the illustrations. There are many books about different facets of Virginia horses – fox hunting, steeple chasing, thoroughbreds and racing – but there wasn’t one general history. Now there is. Want to know more? Ask your independent bookseller to order it for you from the University of Virginia Press. Julie will sign her book March 20 at Fountain Bookstore in Richmond and May 11 at the Library of Virginia in Richmond. March 14-20 is Sunshine Week. After this winter, we could all use a week of sunshine, but that’s not what this week is about. It’s about openness in government and letting the light in. Journalists are the only profession protected by the U.S. Constitution and so they carry a heavy burden – most are happy to do so. When citizens don’t want to sit through a mind numbing four-hour council meeting, reporters do. When we don’t want to wade through thousands of documents to discover the truth, journalists do. Sunshine Week is an initiative spearheaded by the American Society of News Editors to educate the public about the importance of open government and the dangers of excessive and unnecessary secrecy. It coincides with James Madison’s birthday and National Freedom of Information Day on March 16. The initiative is working as people are playing more of a role in the actions of their communities, according to the Sunshine Week Web site. They are learning what kinds of information they have a right to see, where to get it, how to get it and what to do if someone tries to keep it from them. NFPW supports such openness year round through its First Amendment Network. You can join any time (no charge!) through the NFPW Web site or during the NFPW Communications Conference in Chicago, Aug. 26-28. Nebraska Press Women member Diane Wetzel wrote an article for The North Platte Telegraph pointing out a major contribution that Nebraska made to the legal interpretation of the First Amendment. Visit the NFPW Web site to read the entire article. One of the nice things about writing a blog is hearing from other communicators. Arlene Uslander of Arizona Press Women wrote to be about a review she wrote on “Talk Radio Wants You: An Intimate Guide to 700 Shows and How to Get Invited” by Francine Silverman. Arlene notes that radio interviews are easier than ever because you can do them by phone and it really helps her to promote her books. But how do you find the right show for your expertise? Most radio Web sites and listings do not include information about the show’s themes or guest criteria. “Silverman’s unique reference guide is designed for anyone with a product or service to promote who wants to go on radio,” Arlene says. “Talk Radio Wants You: An Intimate Guide to 700 Shows and How to Get Invited” is available at http://www.talkradioadvocate.com, from the publisher at http://www.mcfarlandpub.com and from book stores and Amazon.com.